Please fill in our online form and submit your abstract (max. 250 words) by February the 22nd. The Organising Committee of The British Postgraduate Network for Chinese Studies is calling for abstract submissions on the theme “Hetero/Homogeneous China: Connections, Dynamics, and Transformations”. 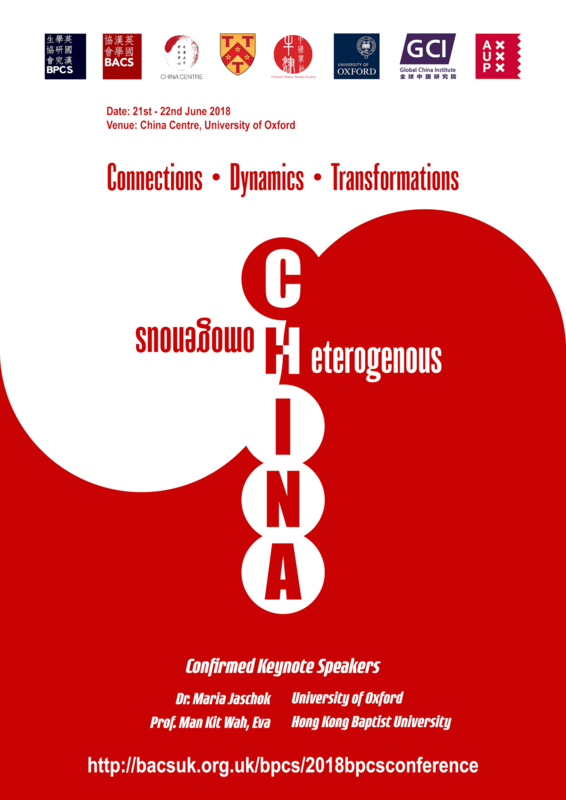 Our annual conference will be held in China Centre at the University of Oxford, on the 21st and the 22nd of June, 2018. We look forward to presentations about the paradoxes and integrations of different dynamics that shape China across time and space. We will accept mostly paper presentations but also a limited number of presentations delivered through other media, such as films, music, and performance art. Please note that we are NOT able to sponsor your VISA and TRAVEL expenses.